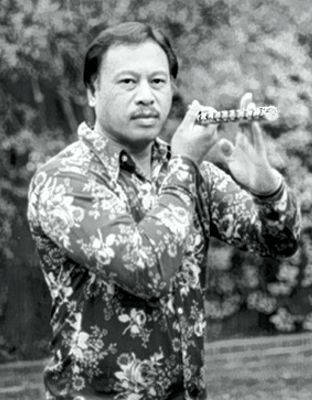 Grandmaster Max Sarmiento was one of the first Eskrima masters to teach his art, Sarmiento Kadena De Mano, to the American public and therefore was responsible for helping to spread Filipino Martial Arts in the United States. Sarmiento Kadena De Mano was well known for its effectiveness with empty-hands, dagger and weapon counter measures. Along with Grandmaster Angel Cabales, Grandmaster Sarmiento’s family style of Kadena de Mano was a major influence in the development of the Inayan System of Eskrima as taught by Mangisursuro Michael G. Inay. Along with Mangisursuro Inay, Grandmaster Sarmiento was a founding member of The West Coast Eskrima Society or WES, an association of Eskrima masters in California founded in 1979 for the purpose preserving, propagating, and promoting the Filipino martial arts. The society was able to unite several Filipino masters under one organization. Among the notable Eskrima masters who joined WES along with Max Sarmiento, included Mike Inay, Jimmy Tacosa, Jeffrey Elliott, Sam Tendencia, Dentoy Revillar, Gilbert Tenio, Leo Giron, Narrie Babao, Dan Inosanto, and Richard Bustillo. Max Sarmiento was born on April 26, 1929 and passed away on September 29, 1982.